Pioneers in the industry, we offer colour coating sheet and galvanized color coated sheet from India. We are identified as one of the eminent organizations that are engaged in trading and supplying a vast assortment of Color Coated Plain Sheets. Offered array of sheets is manufactured at our vendors' state-of-the-art manufacturing facility employing latest machines. To ensure their safe transit at clients' destination, we pack these sheets using premium quality material. 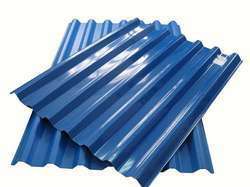 Kerala : Kochi , Thiruvananthapuram , Kozhikode "
We specialize in manufacturing Color Coated Galvanised Galvalume Sheets that are manufactured according to the industrial standards. Color Coated Galvanised Galvalume Sheets trapezoidal profiles are used for widely diverse applications. As they have large range of geometric designs, they offer variety of architectural possibilities. 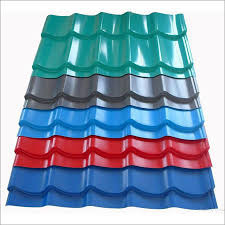 Color Coated Galvanised Galvalume Sheets trapezoidal profiles are supplied not only in different sections and thickness but also in various heights and required dimensions. They are suitable for use as Roof and Wall Panels, in single or double shell construction. The steel sheets are galvanized coated with RMP/SMP/HDP/PVF2 and the basic steel used in the processing are galvanized as per are 275 with zinc coating around. These are available in different sizes as per client specification.